Alex Pyle and Ed Mallard pose with Traeger, Big Green Egg and Weber grills that they, along with Calixto Vazquez, will be using in their grilling competition on Saturday, April 29 at Brandywine Ace, Pet & Farm. POCOPSON — Brandywine Ace, Pet & Farm is taking Ace’s 2017 “grill your Ace off” theme to a new level! 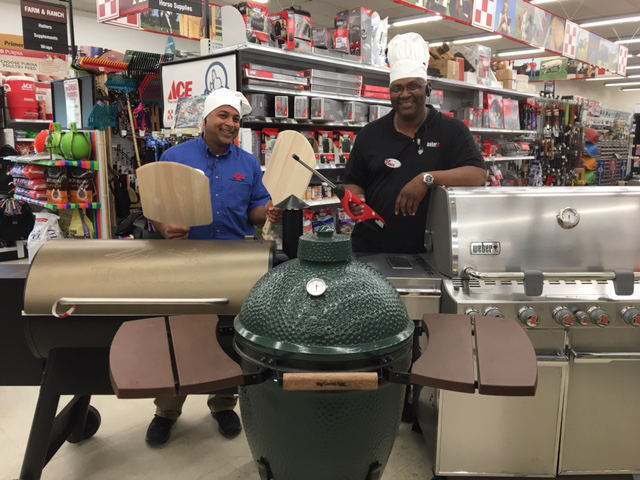 On Saturday, April 29 from 10 am until 3 pm, Ed Mallard, Alex Pyle, and Calixto Vazquez will be in keen competition to be named the store’s top chef as they grill a variety of meats and vegetables on Big Green Egg, Traeger, and Weber grills. The public is invited to stop by and taste test and then cast their vote. There are numerous incentives to buy a grill at Brandywine Ace, Pet & Farm that day. First, the store is offering a “tax back” incentive – saving you 6% right off the bat! Plus, you receive free fuel with any grill purchase – wood pellets for Traeger, propane for Weber, and charcoal for Big Green Egg. In addition, all grilling accessories are 20% off with a grill purchase. Reps from all three of these top grill manufacturers — Big Green Egg, Traeger, and Weber will be at the store all day to answer any questions you might have. The sales incentives will be in effect all day as well. A Yeti cooler demonstration is also planned because no matter how good the grills are, they can’t keep your beer and soda cold.